This is an ultrasonic distance sensor module with open dual probe. It adopts I2C communication and standard interface of Gravity PH2.0-4P vertical patch socket. The module is compatible with controllers with 3.3V or 5V logical level, such as Arduino and Raspberry Pi. The ultrasonic sensor comes with built-in temperature compensation, providing effective ranging within 2cm to 500cm. It offers resolution of 1cm and accuracy of ±1%. There are three measurement ranges designed for programs to select: 150cm, 300cm, 500cm. Please note that setting shorter range will cause shorter ranging cycle and lower sensitivity. You may need to set it according to the actual use. URM09 is a simple and practical ultrasonic sensor. It adopts I2C communication, which is very convenient to communicate with other boards that is equipped with I2C interface. 0×00 Device Address R/W 0x08-0x77 0x11 I2C salve address, the default address is 0x11. If the address is changed, the new address will be valid after repowering the module. 0×08 Command Registers R/W 0x00 Writing 0X01to this register under passive measurement mode and the module ranges distance once. The write data is invalid under automatic measurement mode. 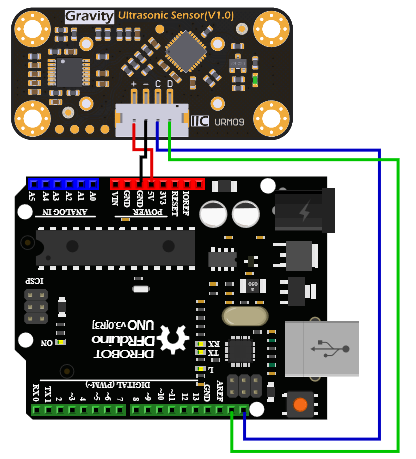 Connect the module to UNO via I2C interface, shown as below. The default measurement mode is passive mode. Send ranging command by write register, and then the module will start ranging once after receiving the command(ranging cycle is related to measurement range). When finished the measurement, the read distance register could obtain a distance value. When measuring the temperature, just read the temperature register and then the measured value can be available after simple processing. txbuf =  (MEASURE_MODE_PASSIVE | MEASURE_RANG_500);//the measurement mode is set to passive mode, measurement range is set to 500CM. The default I2C address of the module is 0x11, and users could change it according to the actual use(the new address would only be valid after repowering the module). 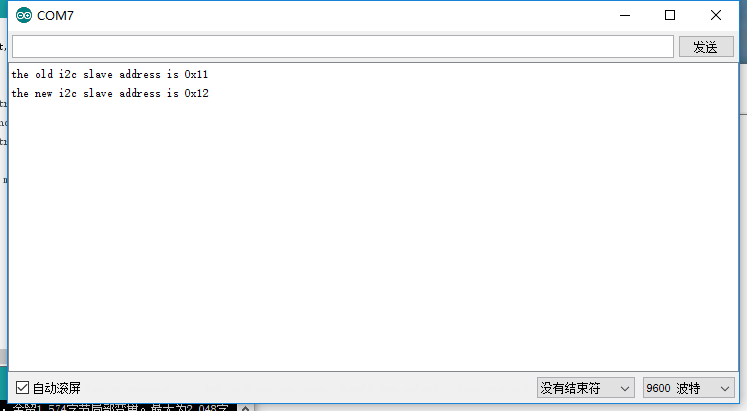 You may forget the I2C adress after setup, but you can search the I2C adress of the module through the following code. Shown as below. Get URM09 Ultrasonic Sensor(Gravity I²C) from DFRobot Store or DFRobot Distributor.